Reliance Jio has announced two new prepaid plans for the upcoming year 2018. Know all about the new Jio prepaid plans. Reliance Jio wishes its customers Happy New Year 2018 with 2 new prepaid plans of Rs 199 and Rs 299. 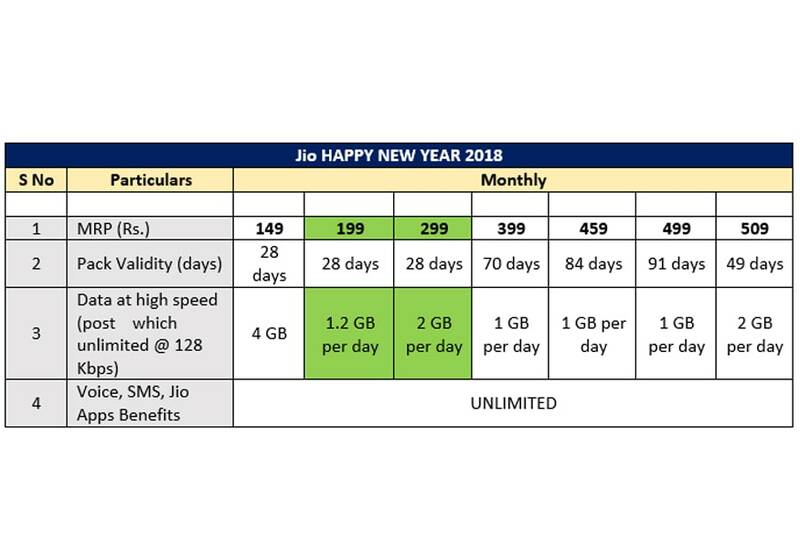 With the Happy New Year 2018 plans, Jio aims to bring higher data benefits to Jio subscribers. The Rs 199 plan provides free voice, unlimited data (1.2 GB high-speed 4G data per day), unlimited SMS and subscription to Premium Jio Apps for all Jio Prime Members for 28 days. For high data users, the Rs 299 plan offers free voice, unlimited data (2 GB high-speed 4G data per day), unlimited SMS and access to Premium Jio Apps for all Jio Prime Members for 28 days. As per Jio, these two plans are first of its kind monthly plans with such high data benefits.